Mettler Toledo presents two new titration brochures to assist laboratory personnel in method development and implementation. 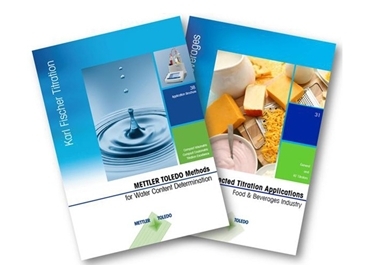 Expanding an already extensive titration brochure portfolio, the two new brochures ‘Selected Titration Methods for the Food and Beverages Industry’, and the thoroughly revised Karl Fischer Applications Brochure ‘Methods for Water Content Determination’ explain the chemistry behind common Karl Fischer, food and beverage titrations, and give practical advice for sample and reagent handling. The Food and Beverage (F&B) industry is subject to regulations covering the entire production process for the benefit of food safety, consumer protection and international trade. Requirements are stipulated for composition, microbiological status, residues, contaminants and other properties. Well defined analytical reference methods are therefore needed at all stages of the production process. Content determination by titration is a widely used analytical technique, particularly for routine analysis of raw materials as well as final products. Titration Applications Brochure No. 31 collects representative titrimetric methods widely used and approved in the F&B industry providing a valuable aid for the development and implementation of titration methods. Moreover, even across diverse industries, knowing the water content is crucial with respect to product quality and properties. If the water content is not according to specifications, food may not taste as expected, prescribed drugs can degrade before use, lubricants can damage the machinery in which they are used and raw materials may be unsuitable for production use. Karl Fischer Titration has long been the method of choice for water content determination, mainly due to fast analysis times, accuracy, repeatability, chemical selectivity to the water molecule, and simple operation. The brochure lists the methods of choice for a variety of specific samples in the first section while the second section covers the results, methods used and more background information for a large variety of samples in numerous industry segments. An overview of Karl Fischer reagents is presented in the third and final section to assist in selecting the most suitable chemicals for analysis.